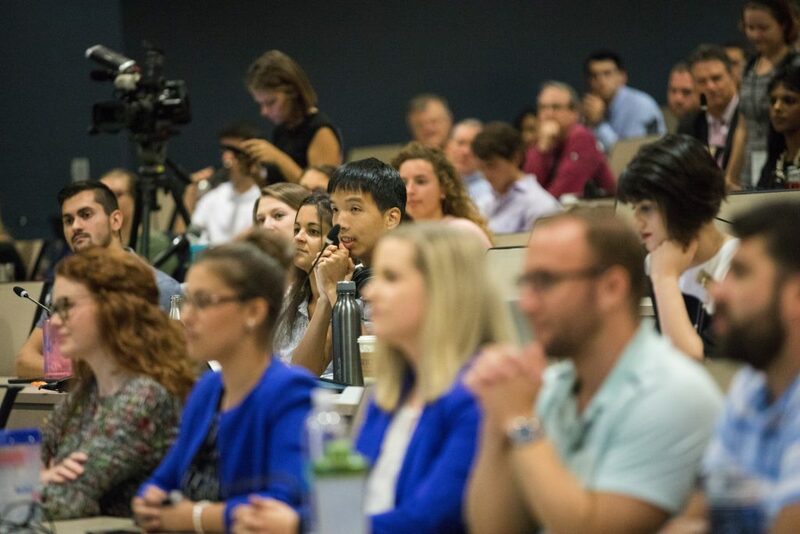 Virginia Governor Ralph Northam helped a former opioid addict tell his story at Liberty University’s College of Osteopathic Medicine Sept. 5, hoping the story will speak to others also struggling with opioids. 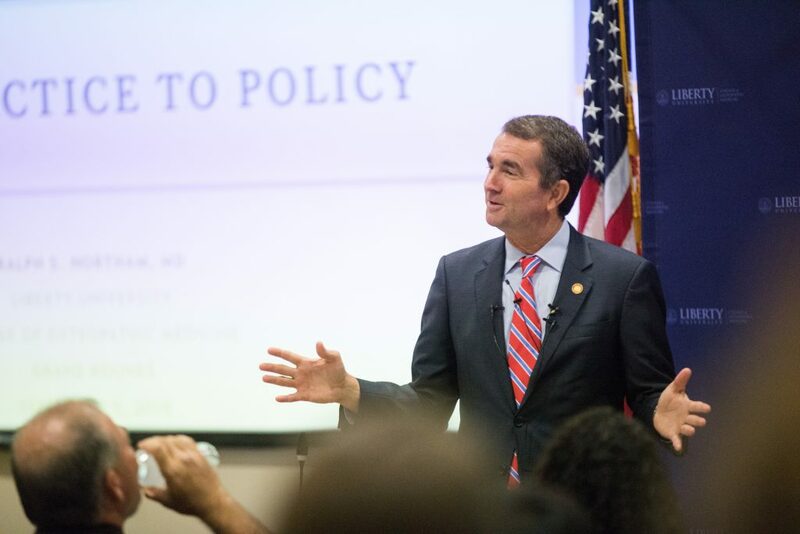 Northam, a physician, has been making his Medical Grand Rounds tour lectures to speak about the opioid crisis, which he believes is one of the biggest crises in Virginia. Liberty was the governor’s last stop on the tour. He explained that he could talk about patients all day, but it would not be nearly as effective as if the patient was the one telling it. “If you hear the story from the patient, it’s something you’ll never forget,” Northam said. The governor then introduced Ryan Hall, a former opioid addict who has now been drug-free for over a year. Hall had everything going for him in high school. He grew up in rural Covenant, Virginia, where he was active in many clubs and played football on the school’s team. But that all changed for him when he suffered several severe injuries during one of his games. He fractured his tibia, dislocated his kneecap and tore his ACL and meniscus. His injuries needed surgery, requiring him to stay in the hospital for four days before the doctors could operate. During his long days in the hospital, he received dilaudid, percocet and tramadol to dull the pain. He believes this is where his opioid addiction first began. Eight months later, Hall broke his tibia again, and he received more medications for the pain. “I was taking the prescriptions for the pain, but I found that once everything was healed, I still would like to take prescriptions from time to time,” Hall said. At this point, Hall said he was not taking the prescriptions to get a buzz, but just to lessen the withdrawal symptoms. He said the withdrawal symptoms were like the worst case of the flu he had ever had. He described experiencing a cold sweat, diarrhea, nausea and insomnia, among other symptoms. After Hall was no longer able to get prescriptions from doctors, he turned to dealing drugs and stealing to get his next fix. He started using heroin laced with fentanyl to get an even stronger effect. Northam said that in 2017, 1,534 Virginians died from addiction, and 1,227 of those deaths (80 percent) were from opioids. He emphasized that most of these addictions began when patients were prescribed pain-killers. One solution could be to prescribe these medications for only three or four days at a time instead of a week, Northam said. The governor explained several other things Virginia is doing to help opioid addicts, including limiting access to the medications and improving treatment and rehabilitation centers. Northam highlighted the importance of having compassion toward these people. “These are not bad people, they’re good people who have gone down the wrong path,” Northam said.